Eastwoodhill near Gisborne, the National Arboretum of New Zealand are holding an exhibition of the work of Photographer Ebony Whitaker of Fine Art Landscape Photography (FALP) in April. The Arboretum has given Ebony access to their extensive 131-hectare gardens for the last 12 months. This includes the largest collection of Northern Hemisphere trees in the Southern Hemisphere displayed in various gardens and plantings over the property. During that time Ebony has captured the seasonal changes of the Arboretum in his exquisite photography. This exhibition is a celebration of “a Garden of Eden, held altogether by the best of the world’s trees” Prof. David J. Bellamy. The photographs includes a variety of locations and subject matter throughout the Eastwoodhill. 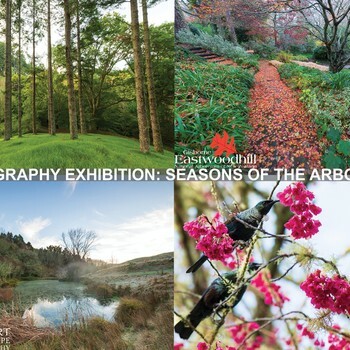 Photography Exhibition: Seasons of the Arboretum Eastwoodhill near Gisborne, the National Arboretum of New Zealand are holding an exhibition of the work of Photographer Ebony Whitaker of Fine Art Landscape Photography (FALP) in April.